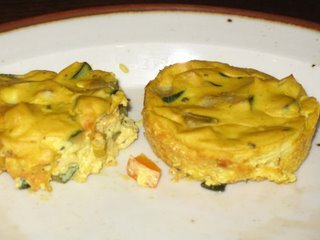 Last night I made Susan's delicious mini crustless quiches. They were very good and fun to eat! My mom was over too, and we all three agreed that they were fun and delightful. What a nice flavor. They did stick a little, even to my decidely non-stick muffin tin. Removing them wasn't easy, but we managed, and that did not affect the great flavor and texture. We also had an enormous mound of collards with them. Tomorrow morning I am headed to San Diego for a few days to meet our friends' new baby girl... so I might not be posting much for a few days. Also, I wasn't in the mood for cooking tonight, so we got take out from Dharmas. 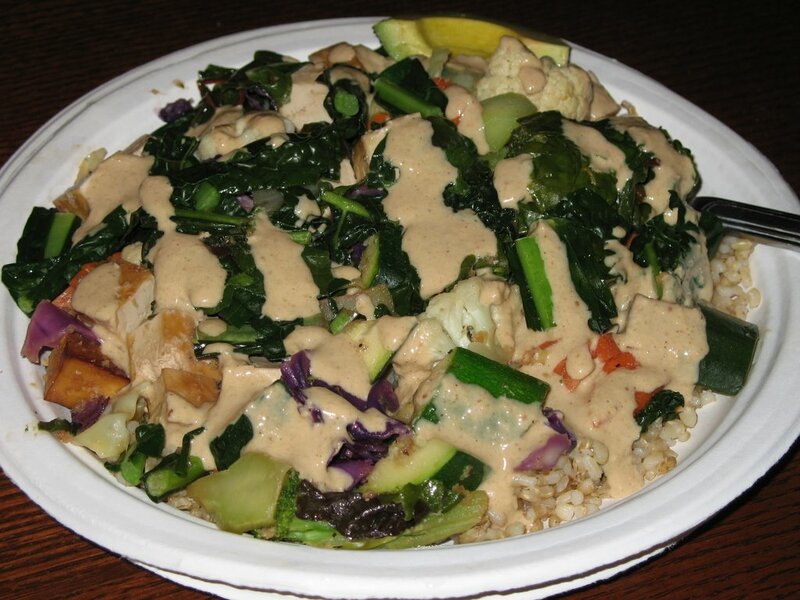 Dharmas is a local veg restaurant that's really good. I ordered the American Saute which is a HUGE plate of kale, zucchini, carrots, cabbage, tofu, and other goodies, served over brown rice with tahini dressing. Yum yum. have a nice few days! Have a great trip to San Diego! My friend who lives there said it was 88 degrees yesterday!! I look forward to seeing more fun and yummy posts when you get back. I made the quiches too! They were really good, and I liked them just as much before baking. Have big fun in San Diego! That American saute looks *LAUGH* --so not American. Anyway, it's not what most American eat--but they sure should, right? I want that American saute! It looks really good. I'm going to try to make the quiche into one large quiche instead of little ones. uv - your comments crack me up. what an ironic name for the saute. Those quiches are such a hot item right now! Everyone is making them and raving about how good they are. I should probably hop to it and give them a go. I must say, they do look quite scrumptious! Wow, that American Saute does not sound very "American" but it sure looks delicious! And I love the look of those quiches--I really hope to get around to trying them soon myself. Wow! I've got a lotta comments to catch up on! Yeah, the quiches were very fun to make and to eat! Maybe once your big move is over. It wasn't quite 88 degrees (that would have been awesome! ), but it was pretty warm and sunny most of the time... just a little rain, but I'm not complaining. Yeah, your quiche post was one of my inspirations to finally make those little goodies! Ha ha! I guess you're totally right about that "american saute" bit... I don't know why they call it that. I think it has something to do with the spices and seasoning - compared to their Asian Saute, for example. Still, thanks for the laugh! And yes, it sure is what Americans should be eating! The American Saute is one of my top two favorite dishes at Dharma's... the other is their great soup, salad, and rice combo. I know it! The quiches really caught on like wildfire. Looks like Susan really hit the jackpot with that recipe. We must have all had an unknown, pent-up desire for mini quiches!